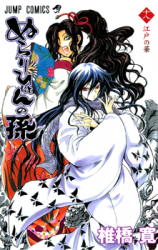 Synopsis: Nura Rikuo, a middleschooler who is three-fourths human and a quarter demon, lives in a house full of spirits along with his demon grandfather. Trying to keep his human and demon sides separate, Rikuo does good deeds in order to seem more like a "good" human and avoid his classmates' suspicions. However, the older he grows, the more difficult it becomes to avoid both his demon persona and his obligations as the grandson of not just any demon, but the master of all spirits! Rikuo's grandfather is looking to make him into his successor, but what does Rikuo want? Nura Rikuo is about to find out that becoming the master of all spirits isn't as easy as it sounds.